In a twisted alternate world the noble Federation is the bad guy in this attempt at a space shooter that doesn't hit the high mark that it was aiming for. Based on the original series episode Mirror, Mirror, I had high hopes for a great game and unfortunately this is not what we got. 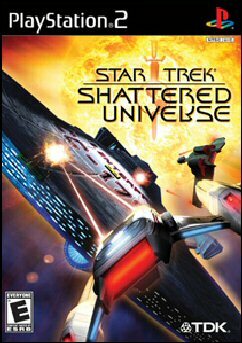 Star Trek games are weird, they are either good or bad, I can't recall one that has ever been inbetween. 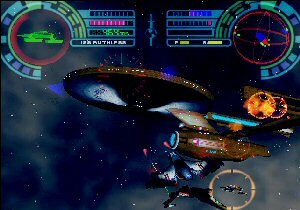 The last really good Star Trek game that I remember would have to be Elite Force and otherwise I'm afraid that I'd have to draw a blank. Being a twisted world, the shuttles that usually accompany the Starships are now fighters and that is the premise behind the game, get in and get fighting! Unfortunately the game doesn't look very good and for that matter is not very inspiring to gamers either. I found that the huge expanses of space started to look the same and the monotony of Sulu's voice telling me the power of the shield of the ship I was protecting was damn annoying and got to the point that I didn't care. Missions can take up to 20 minutes in some cases and there is no save as you go function which will have you grinding teeth to snapping point when you realise that you are going to have to do it again. Repetition in this game is constant and I just got exasperated. 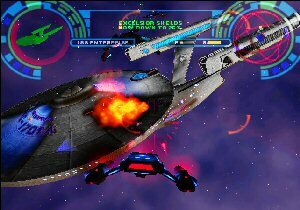 I must admit that at one stage I was encouraged when I realised that I would have to take on a Starship instead of another fighter and then realised that despite there being a number of weapons at my disposal, the only ones that are really going to do the job are the proton torpedoes. ship is beyond me. Not to mention the fact the sounds that accompany the battle do not place any urgency on your defending your Starship, even though the game is finished if it is destroyed. Everything is a bit mechanical and there is not much of the 'human' element which is what in my opinion makes Star Trek so great. And let me say now that I love Star Trek so this review is not being done by someone with no knowledge of the original series or it's spin offs. I hate to say it but I'd probably give this one a miss unless you absolutely had to have everything Star Trek related and even then you are going to be annoyed that you spent the money. I'd definitely say this is a rent before buy type of game and even then some of you are going to feel that you've been ripped off. I just wish in the case of both this and the Star Wars universes that there was a lot deal more effort made to ensure only great products were released instead of half arsed attempts like this to cash in on a great episode of a brilliant sci-fi show. With more attention this could have been good. It's not.